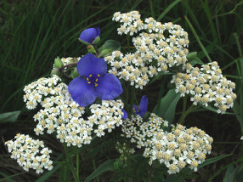 Need some help selecting the best native plants for your area? 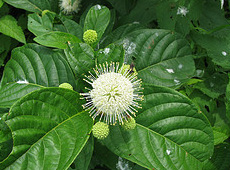 The National Wildlife Federation has a new Native Plant Selection Guide on their website which can help. Enter your zip code and a list appropriate plants will be provided. The plants will be ranked with the one that host the most butterfly and moth caterpillars. Click here to try it yourself! Native gardens can be natural looking or formal in design. It all depends on the plants you choose and how they are arranged. Michigan Audubon has collected several design ideas for sites throughout Michigan. Check them out by following this link. Summer is the best time to identify prairie grasses because of their unique seed heads. To make this easier Grand Prairie Friends has put together an identification guide for eleven native grasses that folds into a pocket sized booklet. Download it here. 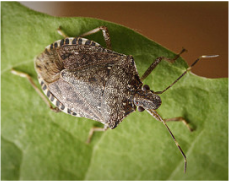 The invasive Brown Marmorated Stink Bug has become established in the Lansing area. They feed on over 300 species of agricultural crops and ornamental plants. They often try to get inside homes and other structures in the fall to overwinter. For more information from MSU extension click here. Seeds for Education Grant Deadline Oct 15th! The Wild Ones national office administers the Lorrie Otto Seeds for Education Grant Program which gives small monetary grants of up to $500 to schools, nature centers, and other non-profit and not-for-profit places of learning in the United States. The deadline is October 15th every year. Follow this link for more information. Bees are declining due to a host of factors including pesticide use and loss of habitat. The Rusty Patched Bumble Bee was listed as an endangered species by the US Fish and Wildlife Service effective March 21, 2017. You can help by planting native plants that provide nutritious pollen and nectar for these fascinating insects. For ideas on which plants will grow best in your soil and light conditions click here. Studies of plants purchased at national retailers found high levels of neonicotinoid insecticides in flowers normally planted in pollinator gardens. The levels found were high enough to kill bees or impair them. Butterflies and caterpillars are at risk too. Some retailer have marked treated plants with tags but uninformed buyers might consider having no insects a benefit. For more information follow this link. All the Red Cedar Chapter native plant sale stock is pesticide free! 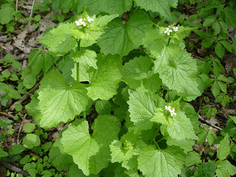 Garlic Mustard will be blooming soon. Spring is the time to pull these invasive plants out by their roots to keep them from taking over our natural areas. The Stewardship Network's Spring Invasive Species Challenge is a fun way to make a difference. Get more information by clicking here. Read our Winter 2018 Chapter Newsletter by Clicking here. Do you want to plant native flowers for the birds, bees and butterflies but find that some are just too tall? You can shorten the height of Asters, Bee Balm, Joe-Pye Weed, Culver's Root and others by pinching back the new growth. You can cut them back by as much as 1/2 to 2/3 which will result in shorter, more compact plants with more flowers. Click here for more information. Read our Spring 2017 Chapter Newsletter by Clicking ﻿here﻿. Read our Winter 2017 Chapter Newsletter by Clicking ﻿here﻿. Spring Peepers, Chorus Frogs and Wood Frogs can be heard singing in Mid-Michigan ponds and wetlands in early April. The males call to attract mates soon after ice melts in the spring. Growing native plants will attract the insects frogs and toads need to eat. Listen to the sounds they make by clicking here. Dead trees are a valuable source of food and shelter for insects, birds, and mammals. Consider allowing a snag to stay standing on your property as long as there isn't any danger of it falling on a structure or person. Click here for more information. Sandhill Cranes are back in the area and are courting.These are the largest birds in Michigan and they are coming back from their Florida wintering grounds. The DNR website states that Michigan has 805 breeding pairs. Their courtship rituals include dancing, calling and throwing sticks. See for yourself in this video. In March of 2002 the Red Cedar Chapter graduated from a "seedling chapter" to an officially recognized chapter of Wild Ones Natural Landscapers, Ltd. In the 15 years since, we have grown from 9 members to over 80 members. At our March meeting we will celebrate this milestone. See all the details here. 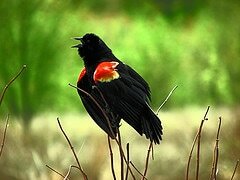 The first Red-wing Blackbirds were heard singing in South Lansing on February 23, 2017 (about 3 weeks earlier than usual.) These birds migrate to the Southern United States and Mexico for the winter and are just now returning to stake out a breeding territory. 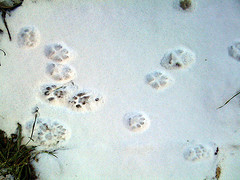 Hear their song and learn more here. University of Wisconsin–Madison engineering senior Matthew Hamilton invented a new way to keep invasive Buckthorn trees from resprouting after they have been cut--without the use of herbicides! A Buckthorn Baggie placed over the cut stump deprives the plant of light and eventually kills it. Learn more from this University of Wisconsin news article or by visiting the website. The invasive Brown Marmorated Stink Bug has become established in the Lansing area. They feed on over 300 species of agricultural crops and ornamental plants. They often try to get inside homes and other structures to overwinter. For more information click here. 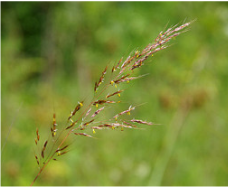 Late Summer is the best time to identify prairie grasses because of their unique seed heads. To make this easier Grand Prairie Friends has put together an identification guide for eleven native grasses that folds into a pocket sized booklet. Download it below or from their website. 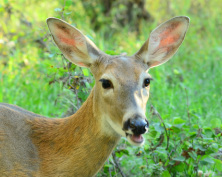 Are deer using your landscape as an all-you-can-eat buffet? Download our list of deer resistant native plants below for options they will avoid. Remember that new plants fresh from the nursery are especially nutritious and succulent. Keep new plants caged to protected them until they are established. Then the listed plants should be able to survive, since deer generally find them unpalatable. 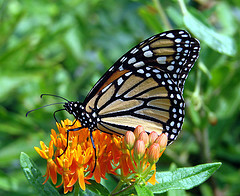 Did you know that Monarch butterflies are dependent on milkweed? It is the only food source for their c﻿aterpillars. Modern farming and roadside maintenance activities have reduced the amount of milkweed available. You can help by planting milkweeds on your own property. For more information on Monarchs click here or download the brochure below. 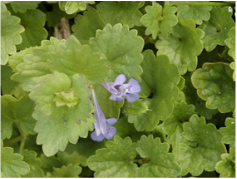 The European weed, Creeping Charlie, invades shady damp areas and can smother a lawn. If you are tired of hand weeding, Borax can help. Research done by Iowa State University indicates that this laundry booster can control Creeping Charlie when applied properly. Click here for the recipe. Read our Spring 2016 Chapter Newsletter by Clicking here. Come to Our Fall Native Plant Sale on September 21st! Look at Pictures of Our 2015 Events in the ﻿Photo Gallery﻿! Perennial plants flower at different times throughout the season. Plan your landscape to include sources of pollen and nectar from Spring until Fall so bees, butterflies and hummingbirds always have a source of food. Here is a link to a guide from Michigan State University to help you. The Red Cedar Chapter is once again offering a 25% discount on Wild Ones T-shirts exclusively to Chapter members. Either of these two styles can be purchased for $15 each. 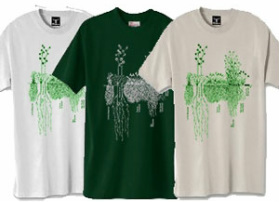 Non-members can purchase the shirts for their list price of $20. If you would like to purchase a T-shirt, send an E-mail indicating which styles, sizes, colors and quantities you would like. Plan to mail a check or pay in person at the July or August Chapter events. T-shirts will be available for pickup at fall chapter events unless other arrangements are made. If you would like to join the Red Cedar Chapter in order take advantage of this special offer click here. Did some of your shrubs get destroyed by heavy ice and snow this winter, or were they eaten by rabbits? Consider replacing them with native shrubs which are better suited to Michigan's weather extremes. Click here for some ideas from Michigan State Extension. and They Need Our Help! The northward migration of Monarch butterflies is beginning. Migrating monarch butterflies are in "grave danger," according to a report that shows their colonies in Mexico now occupy the smallest area since records began in 1993. You can help: PLANT MILKWEED! 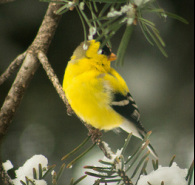 Despite the cooler than normal temperatures in Mid-Michigan, male Goldfinches are changing to their brightly colored plumage in preparation for breeding season. To learn more and hear their songs click here. No leaves on the trees? Learn to identify native trees by their bark. Many have distinctive features that will help you name them regardless of the season. Click here for photos. 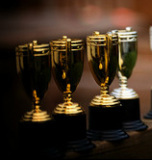 Follow this link to view a recent Lansing State Journal article highlighting these awards. 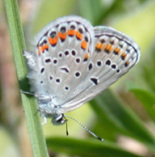 Learn how you can help save the endangered Karner Blue Butterfly. Volunteers are needed to help monitor populations and restore habitat in Michigan's Huron-Manistee National Forest. Download the file below for all the details. 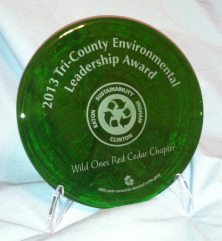 Several Wild Ones Red Cedar Chapter members received awards for their volunteer efforts at Fenner Nature Center this year. An article in the "Seasons" newsletter (below) has all the details. Congratulations to our outstanding members!